How Weather Sparks The Flu: It's All About The Humidity : Shots - Health News Why do people in Boston get the flu when it's cold, while people in Senegal get sick when it's hot? Humidity is a big part of the explanation. But how flu spreads in the tropics and more temperate climates appears to be different. 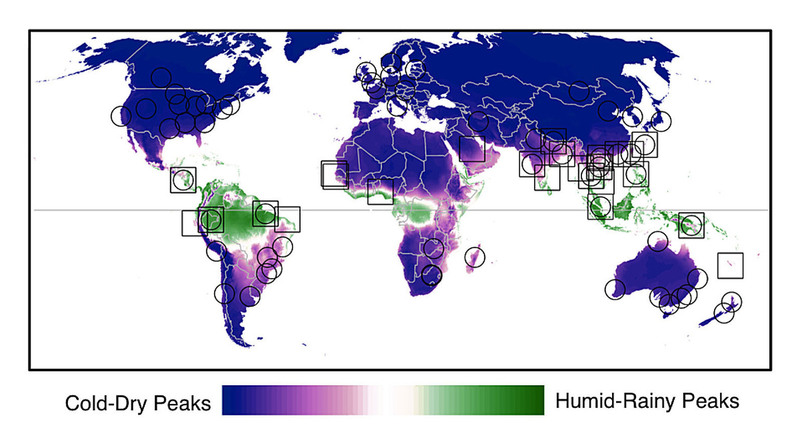 Flu peaks in temperate zones when the humidity is low. In the tropics, it surges when it's humid and rainy. As winter wanes into spring, flu season wanes, too. But while people get the flu when it's cold in the United States, in Senegal they're getting sick when it's hot. It's a puzzle that's baffled scientists for decades. Now, they think they might be have an explanation, though it's not a straightforward one. Places where humidity and temperature drop seasonally, like North America in the winter, have flu outbreaks then. But in the tropics, where the air stays hot all year long, flu season tends to peak with the heavy monsoon rains. Over the years, scientists have come up with lots of theories as to why influenza outbreaks are so strongly tied to the calendar. Maybe it's because people are inside more in cold weather, one theory holds, so the virus spreads more easily. Or maybe it's because people aren't out in the sun making Vitamin D, and their immune systems are weak. Or maybe it's because people travel for holidays at certain times of years, helping spread the virus. So far, not one of these theories has proved a winner. To find out if weather is a factor, a group of scientists stitched together data from 78 different studies of flu outbreaks and climate. They found that in temperate zones, lower humidity and temperature mean flu. And it doesn't even have to be that cold — they set the threshold at about 70 degrees. So people in Tunisia and Texas get the flu when it's cooler, even though they're not shivering. But in the tropics, the scene is more complicated. Humidity remains a driver, but rainfall enters the picture, too. In places like the Philippines and Vietnam with intense monsoon rains (averaging more than six inches a month), flu season peaks when it's hot and rainy. 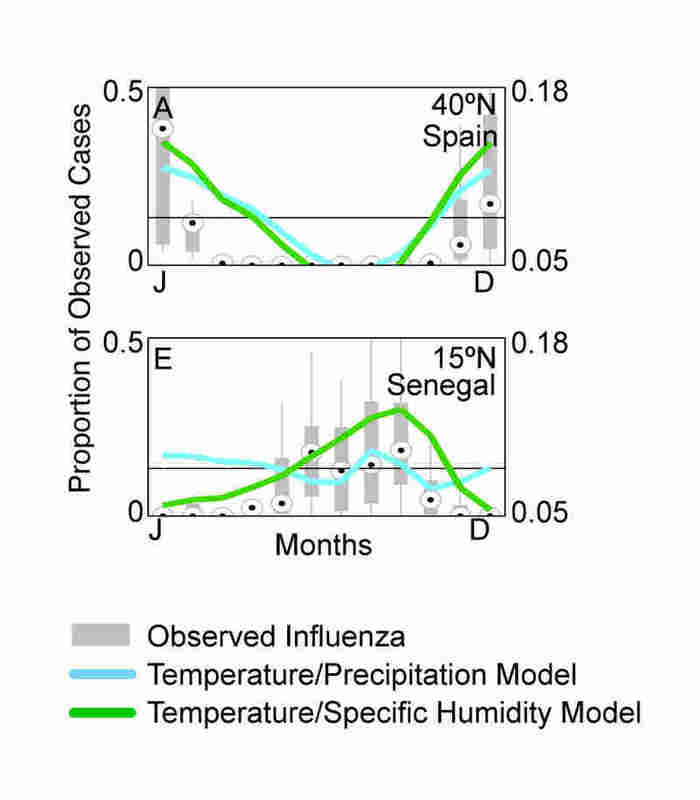 And in subtropical lands like Senegal, the flu seems driven less by rainfall than by high humidity (that's absolute humidity, not related to temperature). "Nobody has a really good theory for what's going on in the tropics," says James Tamerius, lead author of the study, and a postdoctoral student at Columbia University who's studying the relationships between viruses and climate. The study was published in the online journal PLoS Pathogens. It could be that flu viruses are spread differently in the tropics than they are in the cold and dry regions, Tamerius says. But at this point, nobody knows. Environment is just one factor for seasonal influenza, Tanerius adds. Different strains of flu virus may spread better under different climatic conditions, he says, and people's travel might have a big impact, especially in the tropics, where the climate isn't as variable. And flu viruses might survive longer on surfaces or in droplets based on the environment. Nailing down the links between climate and influenza outbreaks could prove useful to public health officials preparing for influenza pandemics, Tanerius says. Last year, the World Health Organization launched a new health and climate collaboration between public health types and meteorologists to try to answer some of those questions. But in the meantime, it never hurts to wash your hands often and bring plenty of tissues when globe-trotting.